It seems that rarely a week goes by in which we do not have cause to visit France and hear a story from the shores of that particular nation. Today we meet another French character and hear a gruesome story from the battlefields of Aspern-Essling. Jean Lannes was a man to be reckoned with. From humble origins he rose to the highest levels of military power and became a confidante and favoured commander of Napoleon, who made him Duc de Montebello in recognition of his efforts. The friendship between Lannes and the emperor was enduring and deep and when the end came for the Duc de Montebello, Napoleon was sharrered at his loss. Lannes was a military commander to be reckoned with. Loyal, brave and a gifted strategist, on 22nd May 1809 he was engaged in the brutal battle of Aspern-Essling, with the French facing off against the forces of Austria in an attempt to cross the Danube. Napoleon's forces came under a barrage of heavy fire and he ordered Lannes to retreat back to the Danube island of Lobau in order to minimise the casualties falling victim to the Austrian efforts. In fact, as their opponents fell back, the Austrians opened cannon fire on the sheltering forces whilst on Lobau, Lannes was in the company of his mentor, General Pierre-Charles Pouzet. As the two men discussed the battle, a cannonball struck Pouzet in the stomach and killed him instantly. Reeling from the shock at watching his close friend die so violently before his very eyes, the dazed Lannes stumbled to the edge of a ditch and sat down. As he gathered his thoughts, shrapnel from a second cannonball tore through his legs, smashing the knee of one and badly injuring the other. Although Lannes told witnesses that his injuries were not so bad as they seemed, he was unable to stand and was rushed for treatment to our old friend, Dominique Jean Larrey. So terrible were the wounds to the Duke's limbs that Larrey elected to amputate one, whilst dressing the injuries to the other, although he would eventually face the trauma of having that leg amputated too. When news of the Duke's plight reached Napoleon, he rushed to his friend's side in a state of utmost distress. 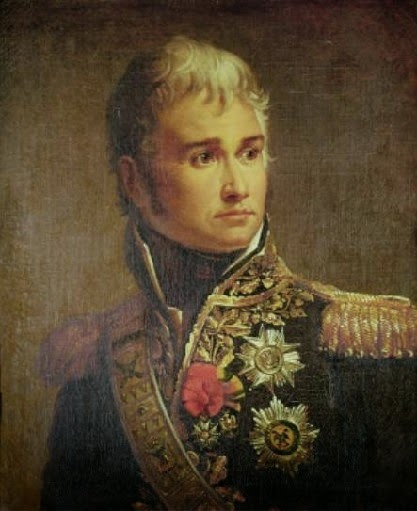 The devastated emperor embraced Lannes and those present noted that he wept bitterly for his injured friend, perhaps counting the true cost of the disastrous battle. Under Napoleon's instruction Lannes was moved to the comfort of a house in Kaiser-Ebersdorf but there was nothing that could be done to save the injured man. Instead he lingered on for a week and, as dawn broke on 31st May 1809, Jean Lannes died. 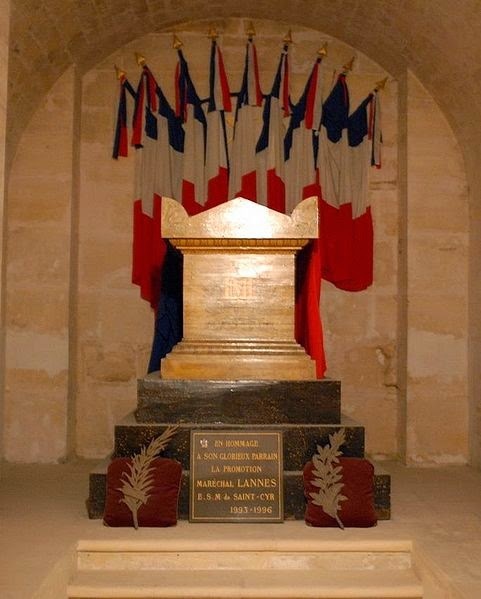 In death, Napoleon ensured that his confidante was feted and his body was interred at the Pantheon, where he rests to this day. Thanks for the nice remembrance--Jean-boy was indeed a force to be reckoned with, as much off the battlefield as on. Sometimes one never knew what he'd say at a dinner party, for example, or an imperial ball, or how he'd say it. Ironically, the state funeral was not until 5 July 1810, and Napoleon didn't attend, saying it might upset his new wife, Marie-Louise, whose brother's army was after all responsible for the occasion. Although the crypt in the Pantheon looks nice and bright in the photo, it's generally much darker when you're there in person. I have never thought Jean liked it much there--he's a sunshine and vineyards kind of guy..
A pleasure; his death felt like one that should be commemorated. I really like your observation regarding the suitability of the Pantheon as a final resting place for Lannes, it does seem very formal and cold for such a chap! Great piece. I believe Lannes' heart is buried in the far more sociable Montmartre Cemetery. There's certainly a crypt with his name on it there which I tracked down last summer. Thank you for your lovely comment; that *does* sound more sociable! Very Interesting subject must research this further, Thank you for posting this!